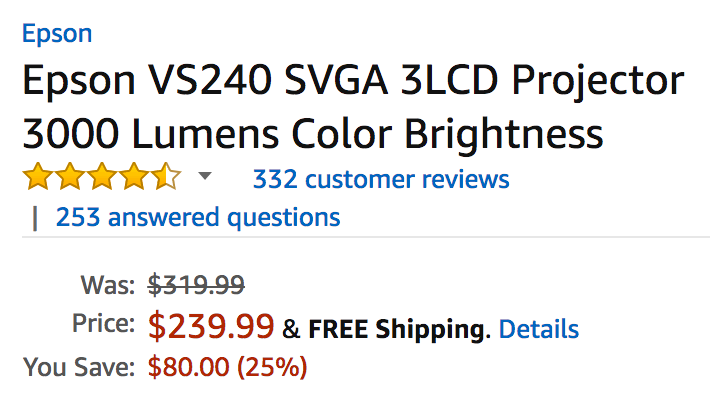 Amazon offers the Epson VS240 SVGA LCD Projector for $239.99 shipped. Also at Best Buy. That’s a $120 savings off the original price, down $60 from most online retailers and a match of the Amazon all-time low. Rated 4.5/5 stars by over 330 Amazon customers. Showcase ideas with this Epson VS240 projector, which displays presentations in 800 x 600 resolution and offers 3000 lumens of white and color brightness for enhanced visibility and vibrancy. USB Plug ‘n Play instant setup lets you get started quickly. 3x Higher Color Brightness and up to 3x Wider Color Gamut with Epson. 3000 lumens color brightness and 3000 lumens white brightness. Fast setup; HDMI connectivity. Look for two numbers: 3000 lumens Color Brightness for more accurate, vivid color3000 lumens White Brightness for well-lit rooms.